Do symptoms above sounds familiar to you? Especially after a long period of computer and near work? If so, you may have Computer vision syndrome (CVS). In today’s info-overloaded world, it’s increasingly common for many of us to work on digital screens for hours, sending text messages, scrolling through Facebook newsfeeds, viewing Instagram photos and then relax by watching YouTube videos. When you focus at small digital screens constantly, the eye’s internal lens accommodates MORE to maintain the focus at near. Thus, causing the symptoms mentioned above as the eye muscles work harder. Have a comprehensive eye examination to rule out vision problems. 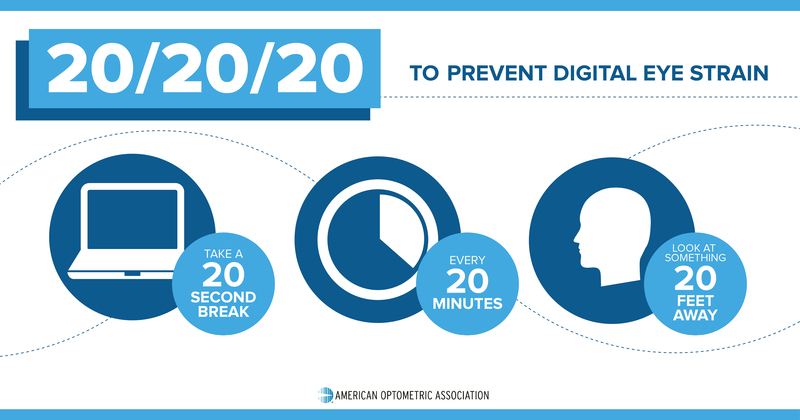 Apply 20-20-20 rule to reduce eye strain. If so, you may consider getting Computer glasses, or Anti-fatigue Lens. It is a type of glasses designed to optimize vision and comfort during digital device use. It enhanced for all your screen usage to help alleviate eye strain, keep your eyes comfortable, relaxed and protected. To know more about Anti-fatigue lenses, please click HERE. Computer vision syndrome (CVS) is becoming a very common problem in today’s digital age as most people are spending more than 11 hours in front of digital screens. CVS should not be ignored as it is not only causing your vision problem, but also reducing your productivity throughout the whole day.